1. You’re giving someone a gift that lasts forever – the gift that keeps on giving Every one of our courses is prayerfully developed to inform, inspire and help each student to grow in the grace and knowledge of our Lord and Savior, Jesus Christ. Once a student enrolls in a course, he or she has access for life. 2. Our online courses don’t need wrapping. No wrapping doesn’t sound like a huge advantage until you’re trying to wrap a candle, child’s toy, or any other object at one in the morning on Christmas Day. Anything that’s not a rectangle defies all wrapping logic. 3. Our online courses don’t break the bank HopeLives365 Online University courses are a highly affordable way to shower your loved ones with affection. 4. There is an online course for everyone There are over twenty-courses in five categories, Bible Study (including biblical archaeology), Prophecy, Health and Wellness, Evangelism, and Leadership. Whether you’re buying for a Christian or a non-Christian, you can find the perfect course to give. 5. Studying and reading make people lives better Reading and studying make people more empathetic, according to science. People who read live longer, too. The information learned from our health and wellness courses could also save a life. 6. There are no accessories needed – batteries not required All that’s required in order to take any of our online courses is an Internet-connected device – smartphone, tablet or computer. No batteries necessary and access is available 24×7. 7. You are helping to spread the Word of God In a world in need of good news and hope, giving one of our inspirational courses helps to spread the good news of the gospel and bring comfort and joy to someone this holiday season and forever. Q: What is a HL365OU Gift Card? A: A HL365OU Gift Card is an electronic Gift Card or eGiftCard delivered via email. Q: What exactly does the recipient receive when I send a HL365OU Gift Card? 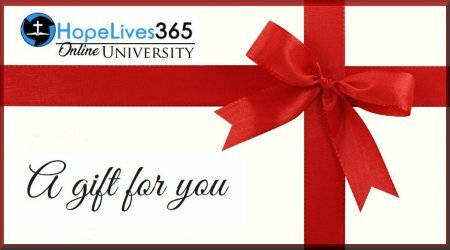 A: Shortly after you complete the purchase of the HL365OU Gift Card, the recipient(s) you listed in the “To” field receives an email from HopeLives365 Online University. The body of the email contains the title with the name you entered in the “From.” For example: “John Doe has sent you a gift card”. The body of the email contains: 1) the text you entered in the “Message” field; 2) the value of the gift card; and 3) the 16-digit HL365OU Gift Card number. To redeem the HL365OU Gift Card, the recipient of the email simply clicks on the Redeem button in the email. That automatically directs the recipient to the HopeLives365 Online University website to browse our list of courses and select the one(s) to purchase, if you did not specify one in your message. On the checkout page of HopeLives365 Online University’s shopping cart, the recipient enters the 16-digit HL365OU Gift Card number, from the email, in the Gift Card Number field, and click APPLY. A credit card is not required if the HL365OU Gift Card balance covers the entire total. Our HL365OU Gift Cards never expire, so any unused balance will remain on the HL365OU Gift Card for future use.